William Clay Bailey married Beth Ann Houghton, daughter of Robert Claude Houghton and Dorothy Heffner, in Jun 4, 1983 at Chattanooga, Hamilton Co., TN, USA, Burean Baptist Church. William Clay Bailey and Beth Ann Houghton were divorced on Jul 12, 1990 at TX, USA. Douglas Tracy Steeb married Beth Ann Houghton, daughter of Robert Claude Houghton and Dorothy Heffner, in Dec 22, 1990 at Tarrant Co., TX, USA, Houghton Family: Grandpraire, Dallas, TX. William Hawkins married Betsy Jean Houghton, daughter of Robert Claude Houghton and Dorothy Heffner, in Mar 30, 1991 at Ft. Pierce, Lucie Co., FL, USA. Daniel Roger Houghton married Joan Marie Holcomb in Feb 27, 1970 at Greene, Chenango, NY, USA. James David Houghton married Mary Catherine Day in Oct 14, 1967 at St. Patrick's Catholic Church, Greene, Chenango, NY, USA. James David Houghton and Mary Catherine Day were divorced. James David Houghton married Kathy Mae Badger in Dec 23, 1972 United Methodist Church. Thomas Eugene Houghton married Elaine Helen Eckert in Dec 13, 1969 at Greene, Chenango, NY, USA, United Methodist Church. Dawn Marie Houghton married Steven James Finch in Sep 26, 1970 at Greene, Chenango, NY, USA. Susan Mary Houghton married Stephan James Byrne in Jun 28, 1975 at Whitney Point, Broome, NY, USA, Methodist Church. John Robert Houghton married Vicki Ellen Moreau in Apr 9, 1977 her second marriage. John Robert Houghton and Vicki Ellen Moreau were divorced circa 1992 Vicki returned to VT with her daughter. Joan Marie Holcomb married Daniel Roger Houghton, son of Calvin Junior Houghton and Ruth Madeline Gorham, in Feb 27, 1970 at Greene, Chenango, NY, USA. Mary Catherine Day married James David Houghton, son of Calvin Junior Houghton and Ruth Madeline Gorham, in Oct 14, 1967 at St. Patrick's Catholic Church, Greene, Chenango, NY, USA. Mary Catherine Day and James David Houghton were divorced. Kathy Mae Badger married James David Houghton, son of Calvin Junior Houghton and Ruth Madeline Gorham, in Dec 23, 1972 United Methodist Church. Elaine Helen Eckert married Thomas Eugene Houghton, son of Calvin Junior Houghton and Ruth Madeline Gorham, in Dec 13, 1969 at Greene, Chenango, NY, USA, United Methodist Church. Hiram H. Houghton married Sophia L. Robson in Nov 3, 1884 at Lafargeville, Jefferson Co., NY, USA, Hiram H. and Sophia L; mar 15 years in 1900 census; Jefferson County Journal Source Date 1884-11-11. William Harrison Houghton married Frances C. Putnam in circa 1892 mar 8 years in 1900 census. William Harrison Houghton married Elizabeth Graham in Dec 24, 1918. Percy Houghton married James Nelson Beach in circa 1892 mar 7 y in 1900; mar 18 y in 1910. 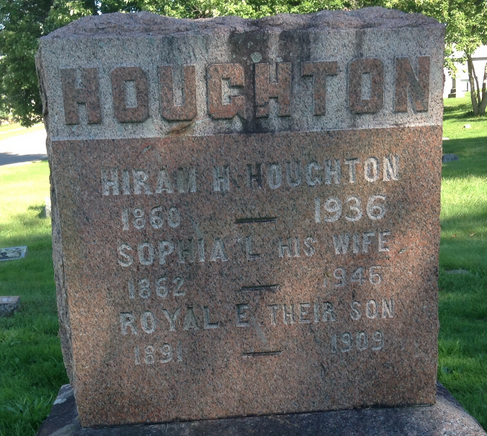 Charles L. Houghton married Anna Peterson in circa 1903 age 29 and 26; mar 7 y in 1910 census.